Even the worst of us require justice. It is a sign of our humanity – wonderful writing. Thanks. I agree, Ginger, and this lawyer is a fine example. Thank you for your kind words. But didn’t you say in the piece that there isn’t any nobility in defending a man who commits heinous crimes? I’m confused…. I did, Pamela, but I also believe that everyone deserves a fair shot at justice. My ideal lawyer would be someone like Atticus Finch who, in the book, chose to defend someone he knew was innocent, even though a just outcome was unlikely in that circumstance, and in that place and time. I also think that twocorbies makes an excellent point in her comment below. I agree. Also, regarding defense lawyers acting on behalf of reprehensible individuals: they’re not really defending the person so much as ensuring that our legal system proceeds as intended. Were we just to mete out justice without due process, mob rule would quickly follow. A stable society only has a tenuous hold, at best. A criminal who is not given proper due process has a good chance of getting freed upon appeal. You are so right. Thanks for your thoughts, twocorbies. My favorite Christmas song has the same title. I love this, Mary! “The sky cracks like a sheet of ice.” Simply beautiful. You are a gifted writer and a gift to us all. Very nice post and congrats on being pressed. PS: I wish it actually were midwinter instead of the beginning. It’s going to be a very long and snowy one! Thanks, bc57! 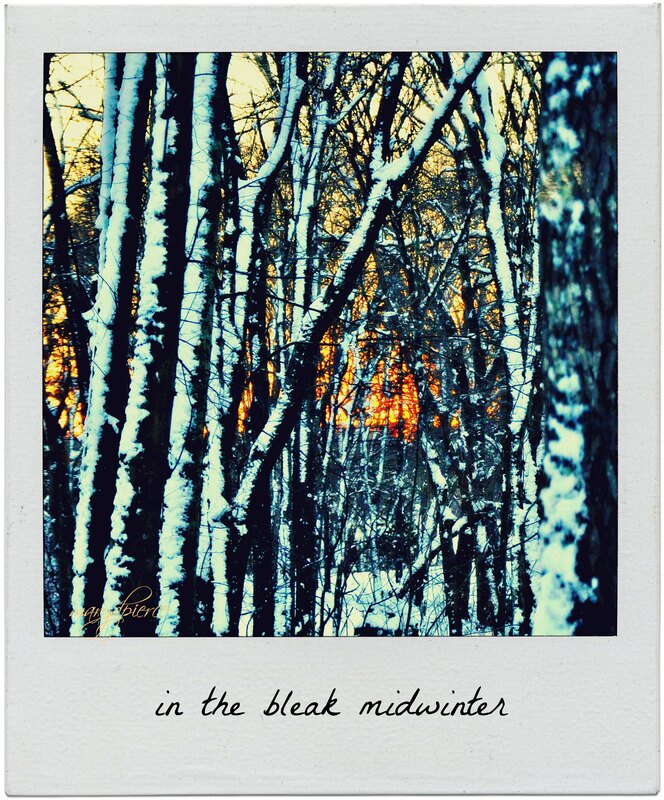 “Midwinter” starts for me when the snow flies. It fools me into thinking it’s almost over. Also, I love the poem (and song) by Christina Rossetti. “The sky cracks like a sheet of glass.” I like that a lot. As do I! Beautifully written, Mary. I wish I could capture your words in a butterfly net and pin them down in a photograph album (to borrow loosely from Counting Crows). And I know I’m not the only one who thought of Fargo, eh? Ah, Christy, we two like minds . . . I actually had a sentence about how I cannot hear the sound of a wood chipper without thinking of Fargo, but cut it in the editing. Thanks for the butterfly image. I love that! Also, love Counting Crows, naturally. We all love a day with a chipper. Such thoughts do go through one’s mind. Your photograph says it all. Fresh breeze, massive growth and leaves. Thanks so much for evoking thoughts of autumn and winter as we are in the midst of a 42 degree heat wave Down-under. Merry Christmas. Ha! When I read your comment I wondered why you would consider 42 degrees a heat wave until I realized that it’s summer in Australia and you were talking Celsius, not Fahrenheit which would make it 107 degrees here, and that is indeed HOT!! I considered wearing noise cancelling headphones, but they hurt my ears if I wear them too long! Thanks for reading and commenting. I appreciate it. Have I told you before how much I admire your writing and love your gift? And clearly, I am not the only one … congrats on being Freshly Pressed!! What validation!!! Oh, thank you so much, LB. You are kind and I appreciate your words. Thanks for the congrats, it is pretty thrilling! I agree with others that you have a talent for writing. However, you need to finish the story. The attorney’s briefcase and affinity for Twain isn’t enough. Criminal defense attorneys take clients to make money. Typically, any aspiration they may have of becoming another Atticus Finch disappears within a few years of graduation. I arrived at this conclusion after covering a number of trials involving banal, if brutal, defendants represented by lawyers anxious to get home for dinner. So, perhaps a second thought to your essay might explore how the attorney you knew, an apparently gentle soul, learned to separate his humanity from his profession. Thank you, TD. I wish summer seemed as long as winter always does, at least to me. I have never seen Bittersweet. You write a beautiful description of it. Thank you. It’s one of those weedy vines that is far more destructive than it looks and is almost impossible to get rid of! I love this, Mary. So lush in its bleakness. Simply wonderful! Thanks, Cathy. It is rather a stark contrast to where you are right now (or recently was, don’t know if you’re back in chilly CO yet). We leave tomorrow. And I just checked weather.com It is cold there. Oh well, it was wonderful being in Bonaire and we’ll be ready to start skiing in a week or so! It’s all good. I just realized this post was Freshly Pressed! Congratulations – it is sooooo richly deserved. You are sooooo sweet! Thank you for the great compliment. Mary, this is an excellent post just like many more from past. Have almost become a fan of your writing. Heartiest congratulation on freshly pressed. Thank you so much, you are kind to say that. I appreciate your generous comment. What an awesome picture! So colorful and goes nice with your post! Any fan of Mark Twain gets extra credit! Although wasn’t it Twain who said “laws control the lesser man … Right conduct controls the greater man.” ? Watch out Atticus. Get that vine while you can! Happy holidays. Yes, I think Twain did say that. And about that vine . . . I googled it trying to find out how to get rid of it once and for all and evidently, the way to do it is by using something akin to napalm! A very happy holiday to you as well! Thanks, Harula. The piece was a kind of exercise in finding a story. It was an interesting approach. Perhaps, I will finish it . . . one day. And, I’m happy you like my photo. Lots of hugs and good wishes for a beautiful Christmas to you, too! Keep warm. a good and well written post. Love some of the sentences. Thanks, Kate. I so appreciate your comment. I love how you weave a winter’s murderous rampage into this sordid tale in the last paragraph. Great writing, always. Ah, Cayman, maybe the guy didn’t want to split (no pun intended) their assets. Who knows what evil lurks (besides The Shadow!) in the hearts of men – and women? I promise my next post will be less murderous and more in keeping with the holidays! Thank you for saying so. Cheers! Reblogged this on Keeping Track. Thank you, Peter. I agree completely. I love photographing the results of winter, just not spending a lot of time standing outside in it. Reblogged this on The Adventures of Madi. I get the vine stranglers too. I used to cut them just above ground but they re-connected(they’re Cute). Now I cut out a 6 inch or 12 inch piece & burn it in my Solid Fuel stove(it feels like a mini ceremony-I get amazing satisfaction out of it, so much so that I’ve no vines left now & I’ll probably have to get a normal Hobby now). The next Winter the vine dies off & loses all its vigour. The best thing to do then is to get as much of it as is easily ripped down, an old thick vine makes very good fuel. I’ve only just realised that this lack of a Chipper means the marvellous option to feed my wife into it is gone. Your words go together like a jigsaw puzzle. The picture is pretty in the end but doing the puzzle is really the good part. Thank you, Lee, a very nice thought, indeed. Reblogged this on Kat's Creation. Don’t know who Sergey is, but, um – thank you?